Russia’s federal operator of Glonass, the NIS company, is strongly interested in India’s market. India has long been famous for its highly qualified engineers and programmers. It is natural that Russia’s federal operator of Glonass, the NIS company, is strongly interested in India’s market. At the same time, Indian innovative achievements can also come in handy in Russia, the deputy head of the NIS company Vladimir Vozhzhov said in an interview with the Voice of Russia. 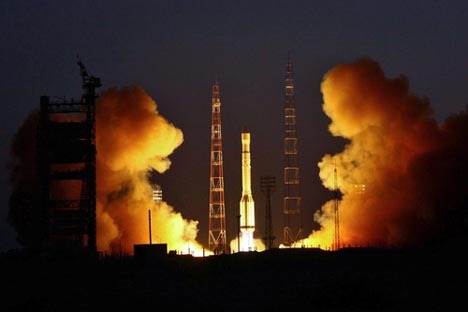 “Last year the Russian Federal Space Agency (Roskosmos), the NIS company and India’s Space Research Organization (ISRO) signed a memorandum of understanding to establish a joint venture that would provide navigation services on Indian territory. A draft agreement has been finalized already and now is due to be considered in Delhi,” Vladimir Vozhzhov said. “The joint venture will help promote Russian technology in India and launch the production of navigational equipment there not only for domestic use but for also for exports into Russia. Later this equipment will be delivered to dozens of other countries interested in operating Glonass,” Vozhzhov believes. “We`ve carried out research into the Indian market and decided where we should apply our technology first. But yet there is a lot more to do since our products are meant for the masses. To achieve this, we need highly competitive products and services based on Glonass and GPS navigation systems,” the deputy head of the NIS company said. “Indian consumers have been already offered such goods and services. We pass over to Indian cities those achievements that we have in Russia, including ‘intellectual’ system of transportation management and traffic control, as well as emergency situations monitoring. Pilot projects have been launched in the Indian state of Kerala, where Russia supplied navigational equipment. Now it is planned to build control centres in Kerala, Andhra Pradesh and Karnataka and supply systems of transportation management to police in Maharashtra. One of the leading construction companies in India is going to use Glonass to monitor the movements of 1,500 cement trucks,” Vozhzhov stressed. India will soon get a firsthand impression of Glonass during a road show involving the country’s leading car makers, he added. Russia and India are set to expand cooperation in high technology. If Moscow and Delhi rely more on science intensive branches, their bilateral trade might get a $20 billion boost by the year 2020, experts at the Russian-Indian business forum in Moscow said. They see Russia’s Glonass Global Navigation Satellite System as one of key fields where the two countries could develop their cooperation.